President Trump is playing a risky game with two of America's biggest trade relationships -- worth a total of $1.2 trillion. The White House said late Wednesday that Trump has decided not to kill NAFTA, the free trade deal with Mexico and Canada, for the time being. Instead he's going to try to renegotiate it. Trump has repeatedly cast doubt over the deal's future, calling it the worst in history. "It's been very, very bad for our companies and for our workers," he said last week. But it's still unclear exactly what Trump wants from a modified agreement. And with Mexican elections looming next year, time isn't on his side. Canada buys more goods and services from the U.S. than any other country: $322 billion last year. Mexico isn't far behind with $262 billion. Together, they import significantly more from the U.S. than all 28 countries of the European Union combined ($503 billion). Both Canada and Mexico buy a lot of American cars, machinery and food. They also sell similar goods to the U.S. There's debate over how many U.S. jobs have been lost to Mexico because of NAFTA. The Economic Policy Institute puts the number at about 800,000 between 1997 and 2013. But a nonpartisan report by Congress published in 2015 found "NAFTA did not cause the huge job losses feared by the critics." What's certain is that increased trade and economic integration mean that more jobs are now at stake. The U.S. Chamber of Commerce estimates that nearly 14 million American jobs depend on trade with Canada and Mexico. 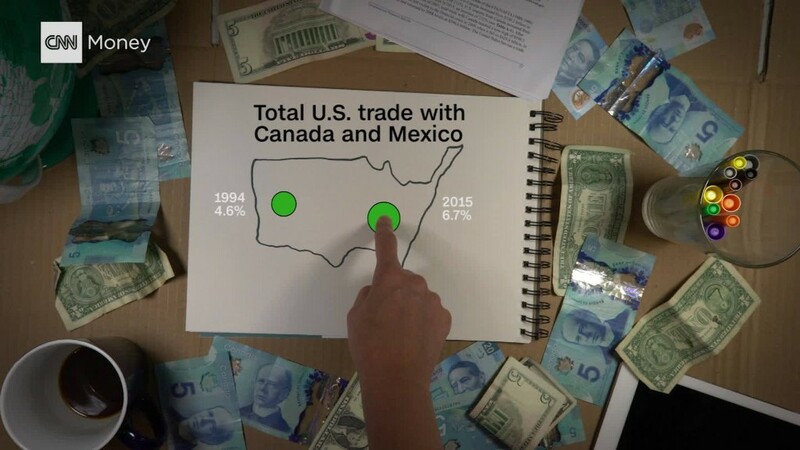 NAFTA, which went into effect in 1994, essentially eliminated almost all tariffs among the three nations, allowing for the seamless flow of goods and supplies across borders. For companies across North America and beyond, it's a fact of life. Billions of dollars of goods move across the countries' borders every day. "You've had a quarter century in which manufacturing companies have organized their supply chains along continental lines with the assumption that the tariff cost will be zero," said Edward Alden, a trade expert at the Council on Foreign Relations. If NAFTA is renegotiated, supply chains in sectors such as clothing and autos could be thrown into disarray.